I didn’t know you shopped at our local Costco! Skeletons on one side of the aisle and Ho ho ho on the other. No one wants to spend money on Turkey Day, so it’s a straight shot from one merchandising event to the next. Here in SoCal, people just leave their pumpkins on the front porch and put a Santa hat on them. Later come the green derbies and then the bunny ears. Poor Thanksgiving! 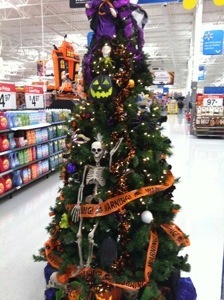 Christmas before Halloween is just creepy! And don’t forget the rows of Christmas stuff made in China at the Rite-Aid, etc. Pumpkins with a Santa hat? I gotta see that! If you’ve got the cheer I’ve got the rind. I have to be timely. There’s only 35 shopping days left until the Presidential Election. There’s still time to pick out that special Romney/Ryan gift in their official online store. Remember, kids. When it’s gone, it’s gone.